Pictured from left to right: Ron Schecter, Alexis Asato, Sarah Sakakihara, Lauren Kenar, Heather Osterstock, Kylee Yagi, Mickey Beutick-Warren, Emily Tsuhako, Brianna Kenar, Peggy Schecter (founder), and Darius Soo Hoo. The mission of the Maui Flute Choir, founded by Peggy Schecter in 2011, is to give flutists the opportunity to play in a unique-sounding ensemble. The flute choir presents a style that is different from orchestra and band playing, as it usually performs without a conductor. This provides a valuable experience for the flutists, who must watch each other, while giving cues or downbeats and changes in tempi. They furthermore rotate playing different parts so that everyone has a chance to learn to be a good ensemble player, soloist and leader. The flutists are encouraged to play the piccolo and alto flute as well as the standard flute. The choir’s repertoire ranges from arrangements of classical and jazz works, to original pieces composed for flute choir. There are also opportunities to play in ensembles, such as trios or quartets. The Maui Flute Choir rehearses once a month at Peggy’s Kula music studio, and performs in public and private settings several times throughout the year. Are you interested in joining our group? Currently, we have one opening. An informal audition is required to become a member. 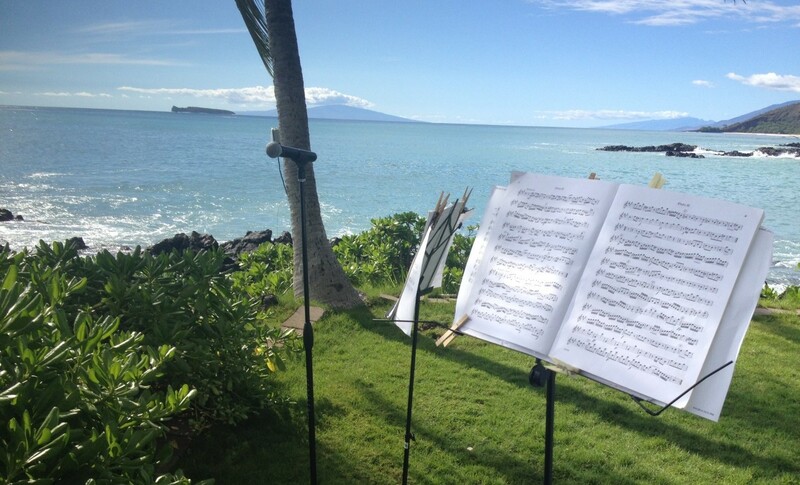 peggyflute@hawaii.rr.com or call (808) 878-8164 for more information. Not sure if you’re ready to join a flute choir? Here are ten reasons you should! 10. To play that flute! Sure, you set it aside for a while while life kept you busy with other things. But now you’ve got a bit of time – and it’s time to rediscover just how much you love playing! 9. You’ll meet new people! The members of a flute choir are a warm and welcoming group of people. 8. And you’ll have something in common with them! We all LOVE flute music! 7. You’ll learn something new! We love trying out new and exciting pieces. 6. You’ll reconnect with some familiar works, too! New is great, but we never forget the classics! 5. You’ll make mistakes. Everyone makes mistakes! And the whole group will be there to help you overcome them. 4. You’ll accomplish something you never thought you could! And the whole group will be there to cheer when you do! 3. You get to perform! Practicing is fun, but performing is exciting – and even more fun with a group! 2. You’ll spread a little joy! Whether it’s a holiday concert or a performance at a community venue, you’ll be responsible for a lot of smiles!